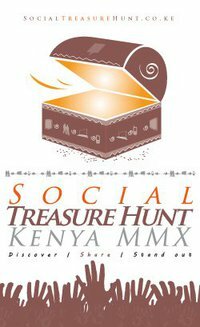 Social Treasure Hunt is a quest by teams, drawn from the members of the public, on a mission to discover the still hidden wealth in our communities using social media and technology. This challenge is a celebration of what we hold dear as global village members, humanity, and more importantly as Kenyans. The Social Treasure Hunt seeks to raise awareness to protect these treasures for generations to come. As a two-day ev…ent, teams will have to camp before they continue the challenge the following morning. Social Treasure Hunt uses Relics i.e. iconic symbols that create topics around unique things about Kenya and at the same time present some aspects of United Nations Millennium Development Goals. They act as ‘carrots’ which, as they get discovered, lead to the Social Treasure site. This first and interactive concept event is open to anyone and everyone above the age of 18. It makes no prejudice whatsoever of any participant’s identity be it country, gender, health related limitation, race, religion, sexual orientation or tribe. Note that Social media are channels for social interaction, using highly accessible and scalable technologies. Social media use social web-based technologies to transform and	broadcast media monologues into social conversations. 9. A non refundable participation fee: KShs. 200,000.00 for a corporate team of four and KShs. 11,000.00 for a non-corporate team of four. 10. Spectators pay Ksh 3000 entry fee for the two days.